Please read and review your class supply lists. We normally carry all of the required items in the store (with the exception of a few items) but you will want to make sure you purchase all of your supplies in plenty of time. Patterns and books required for the class are not included in the price of the class unless specified. Most classes require basic sewing supplies including a Sewing Machine in good working order, thread, scissors, straight pins, seam ripper, pencil, paper, rotary cutter, mat and ruler. We do have a limited number of classroom machines which are available for your use for a small rental fee.. If you wish to use one of our machines, please let us know when you register so that we can try to accommodate everyone that needs one. Please turn off cell phones or set to vibrate. Please do not bring children or guests to class. We always appreciate it when you purchase your fabric from us. 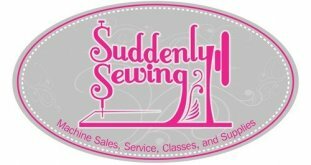 Any supplies that you purchase from Suddenly Sewing for a class, receive a 10% discount.